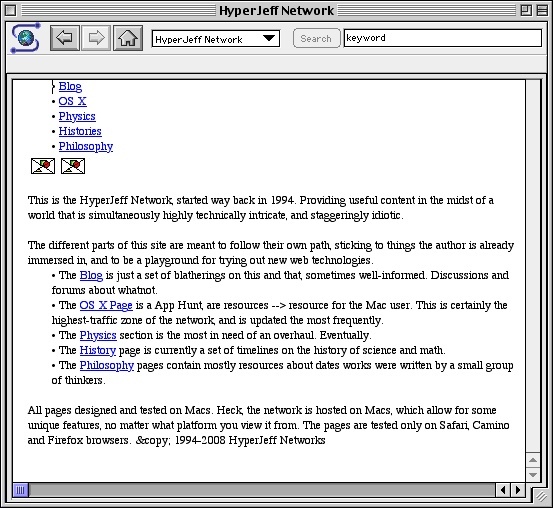 This is the HyperJeff Network, started way back in 1994. Providing useful content in the midst of a world that is simultaneously highly technically intricate, and staggeringly idiotic. The different parts of this site are meant to follow their own path, sticking to things the author is already immersed in, and to be a playground for trying out new web technologies. The Blog is just a set of blatherings on this and that, sometimes well-informed. Discussions and forums about whatnot. The OS X Page is a resource for the Mac user. This is certainly the highest-traffic zone of the network, and is updated the most frequently. The History page is currently a set of timelines on the history of science and math. The Philosophy pages contain mostly resources about dates works were written by a small group of thinkers. All pages designed and tested on Macs. Heck, the network is hosted on Macs, which allow for some unique features, no matter what platform you view it from. The pages are tested only on Safari, Camino and Firefox browsers.